• Fast, wide-angle to medium telephoto AF-S zoom lens optimized for edge-to-edge sharpness on both the Nikon FX (23.9 x 36mm) and DX format image sensors. • Enhanced optical formulas, engineered to produce exceptional sharpness, contrast and color, rendering outstanding image integrity. • Two ED (Extra-low Dispersion) elements and PGM aspherical lenses control chromatic aberrations while enhancing sharpness and contrast, even at the widest aperture settings. • Exclusive Nano Crystal Coat further reduces ghosting and flare for even greater image clarity. 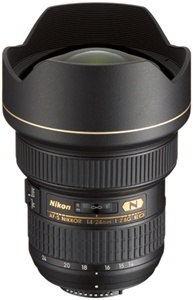 • Nikon’s Silent Wave Motor (SWM) enables ultra high-speed autofocusing with exceptional accuracy and powerful, super-quiet operation. • Internal Focus (IF) provides fast and quiet auto focusing without changing the length of the lens, retaining subject-working distance through the focus range. • Focus as close as 14.9 inches. • Rugged construction and professional-grade dust and moisture resistance. • M/A Focus Mode switch enables quick response to changing situations between Auto and Manual focus operation.